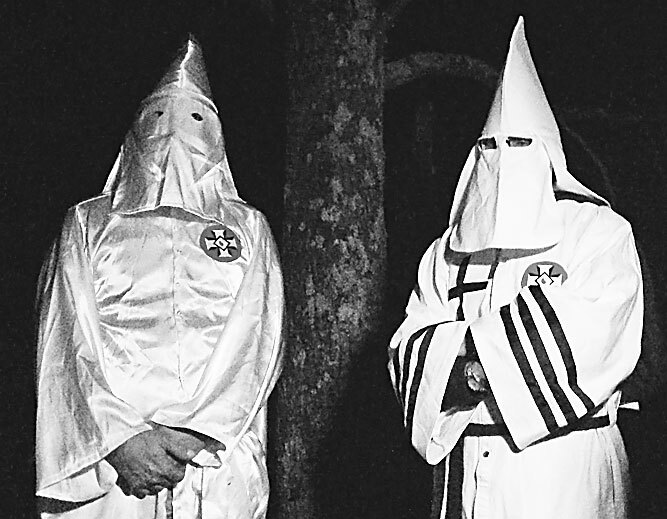 AP Photo Two masked Ku Klux Klansmen stand on a muddy dirt road during an interview near Pelham, N.C.
PELHAM, N.C. (AP) — In today’s racially charged environment, there’s a label that even the KKK disavows: white supremacy. But still, the KKK members insisted in an interview with The Associated Press, they’re not white supremacists, a label that is gaining traction in the country since Trump won with the public backing of the Klan, neo-Nazis and other white racists. Claiming the Klan isn’t white supremacist flies in the face of its very nature. The Klan’s official rulebook, the Kloran — published in 1915 and still followed by many groups — says the organization “shall ever be true in the faithful maintenance of White Supremacy,” even capitalizing the term for emphasis. Watchdog groups also consider the Klan a white supremacist organization, and experts say the groups’ denials are probably linked to efforts to make their racism more palatable.